28 Llangybi Circular at Llangybi Church01633 644850work Walking RouteThe route follows open fields, woodland and lanes in an area around the village of Llangybi. Starting from the oak tree in the village centre the route heads north along the road towards Usk then bears left across a spur into Cwm Dowlais. A further climb takes the walk over Ty’n-y-caeau Hill and into Llangibby Park passing below the castle before rejoining the Usk road back to Llangybi. 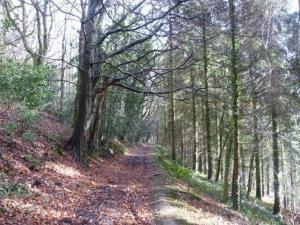 The route follows open fields, woodland and lanes in an area around the village of Llangybi. Starting from the oak tree in the village centre the route heads north along the road towards Usk then bears left across a spur into Cwm Dowlais. A further climb takes the walk over Ty’n-y-caeau Hill and into Llangibby Park passing below the castle before rejoining the Usk road back to Llangybi. Points of interest include Llangibby Park and Castle. The White Hart pub in the village is an interesting building with an interesting history.